It’s fair to say that the Xiaomi Redmi Note 5 Pro has been a bestseller. The phone launched in India in February, and its mid-range list of specifications included the Qualcomm Snapdragon 636 SoC, 4GB/6GB of RAM paired with 64GB of storage, 5.99-inch Full HD+ (2160×1080) IPS LCD, dual 12MP + 5MP (depth sensing) rear cameras, 20MP front-facing camera, and a 4,000mAh battery. It shipped with MIUI 9 on top of Android 7.1 Nougat, but it has since received an update to Android 8.1 Oreo with Project Treble support. The Redmi Note 5 AI Dual Camera shares the same device code-name (whyred) with the Redmi Note 5 Pro, but it is sold in different markets (China and Europe), and has differing camera specifications and network bands. Both phones should not be confused with the Xiaomi Redmi 5 Plus (vince), which is branded as the Xiaomi Redmi Note 5 in India. A few months ago, Xiaomi India announced that the Redmi Note 5 and the Redmi Note 5 Pro have together sold more than five million units. Seven months have passed since the Redmi Note 5 Pro’s launch, however, and Xiaomi has been developing a successor, code-named “tulip.” We have known about the device’s existence in firmware files since April. 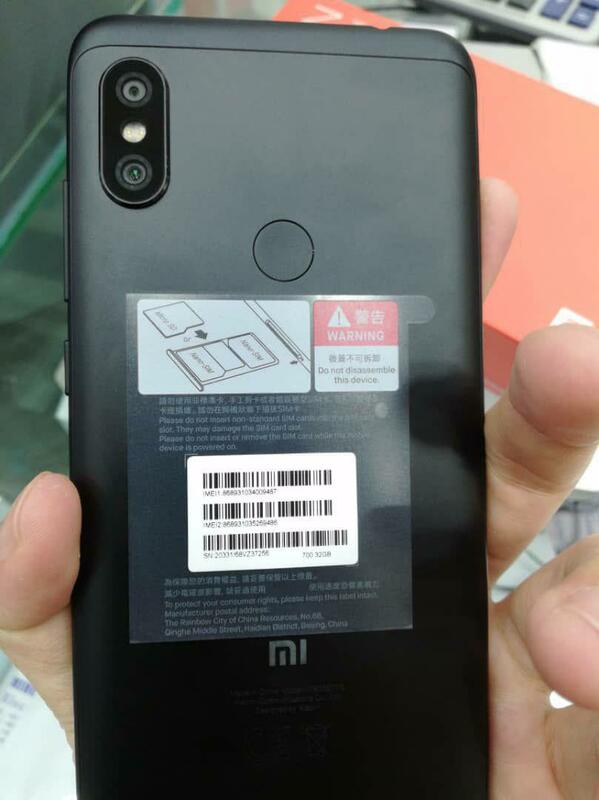 Now, leaked photos of the Xiaomi Redmi Note 6 Pro have appeared online. The original source of the leaked photos is unclear. 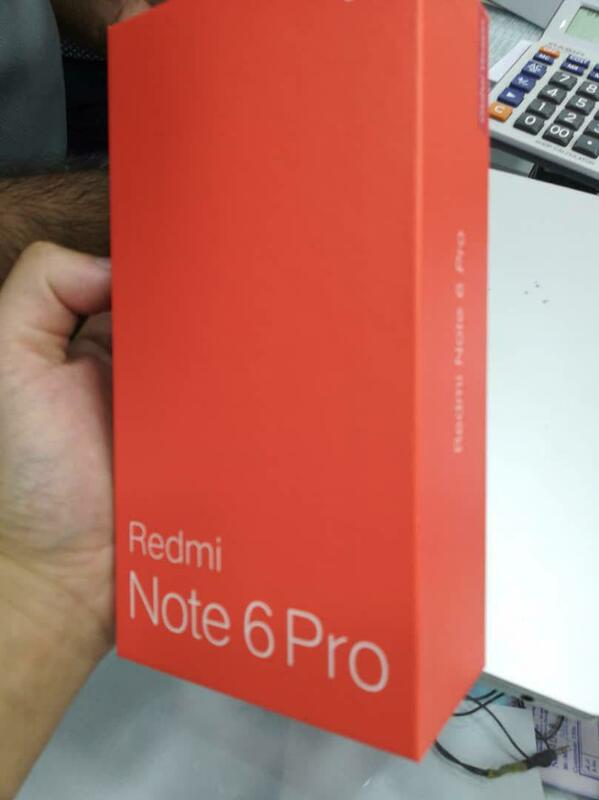 The photos show the box of the Redmi Note 6 Pro, along with live photos of the device itself. However, we were able to determine that the leak is a legitimate one. This is because the IMEI visible on the box is a real IMEI. The model number that the IMEI page shows (M1806E7TG) also matches the Wi-Fi certification that ties the _E7T to the Xiaomi Redmi Note 6 Pro name. 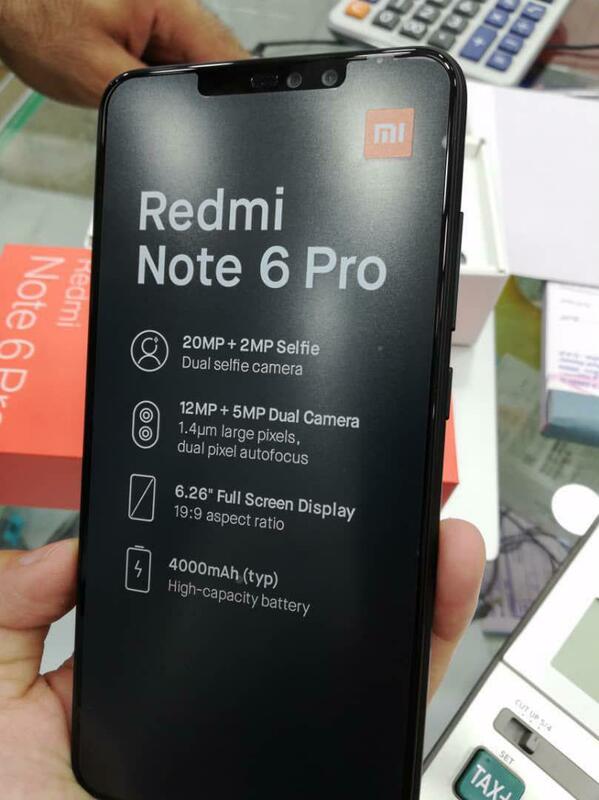 The live photos of the Redmi Note 6 Pro show that the phone will be available with in at least two variants: 3GB of RAM with 32GB storage and 4GB of RAM with 64GB storage. It will be powered by the same Snapdragon 636 SoC that powers the Redmi Note 5 Pro. The Redmi Note 6 Pro will have a 6.26-inch Full HD+ (2280×1080) notched display with a 19:9 aspect ratio, marking a first for the Redmi Note series. The Xiaomi Redmi 6 Pro/Xiaomi Mi A2 Lite already has a notched display, but the Redmi Note 6 Pro’s top and side bezels look noticeably smaller. Interestingly, the phone will have four cameras in total. The rear cameras will be 12MP + 5MP (depth sensing), while the dual front-facing cameras will be 20MP + 2MP. The 2MP secondary front-facing camera will probably be used for depth sensing. The 12MP primary rear camera will have 1.4μm pixels and dual pixel autofocus like the Poco F1. The Redmi Note 6 Pro will be powered by a 4,000mAh battery, just like the Redmi Note 5 Pro. In terms of software, it will likely ship with MIUI 10 on top of Android Oreo. 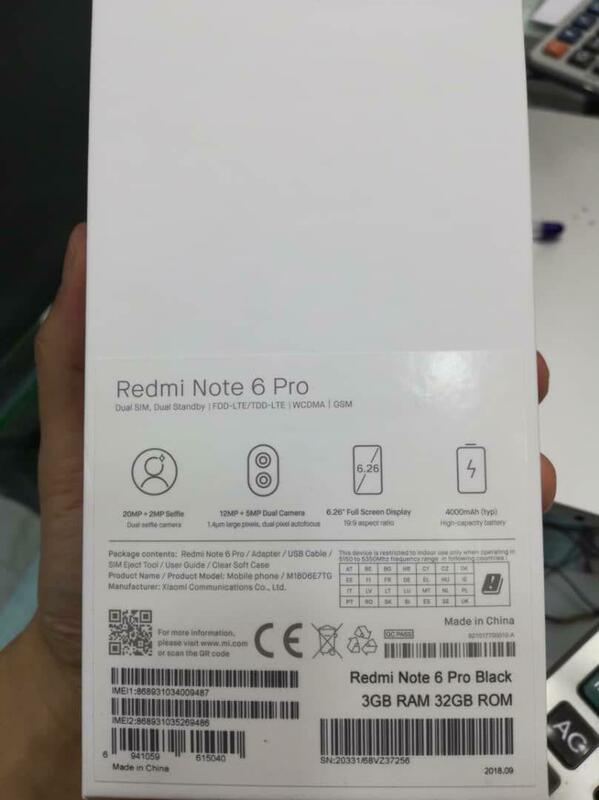 Design-wise, the Redmi Note 6 Pro looks very similar to its predecessor as it still has plastic caps on the top and bottom of the back. This means that it’s not a true metal unibody unlike the Xiaomi Mi A2, which has a full aluminium unibody construction with discreet antenna bands. A YouTube channel named VideoWaliSarkar already did a hands-on video of the Redmi Note 6 Pro. The video confirms the fact that the device will be powered by the Snapdragon 636, and it confirms the rest of the leaked specifications as well. The blue color variant was shown off on video, and in terms of the design, it looks very similar to the Poco F1, with thin side bezels and a relatively thick chin at the bottom. As of now, the Redmi Note 6 Pro’s launch date is unknown, but it’s probable that the phone will launch soon. On account of previous pricing of the Redmi Note series, it’s also fair to expect it to be priced affordably. We expect to learn more about the phone in the coming weeks.